On Monday, April 8, 2019, work will resume on the Cottonwood Drive reconstruction project between Baldwin Street and Bauer Road in Georgetown Township. As a result, the road will be closed to thru traffic. 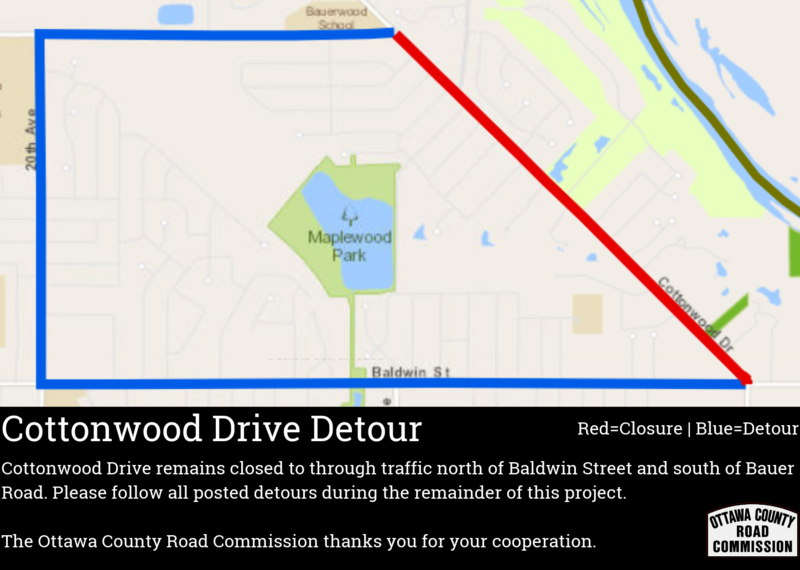 The OCRC asks that motorists follow the posted detour, which consists Baldwin Street/20th Avenue/Bauer Road. Work on completing the project is tentatively expected to last through mid May, weather permitting. Work will include paving the final layer of asphalt on the road, plus restoration work. Coinciding with the start of work on Cottonwood Drive is the start of work on the Ottawa County Parks Department’s Idema Explorers Trail, a 1.2-mile shared-use pathway which runs from Carriage Lane to Golfside Drive off of 10th Avenue. The Ottawa County Road Commission is overseeing construction of the shared-use pathway project for the Parks Department. Contractors are tentatively expected to complete work on the shared-use pathway project at the end of May, weather permitting. More information about the Cottonwood Drive project can be found online at http://www.ottawacorc.com/cottonwooddriveproject/. For more information about OCRC road closures, and to view an interactive map of current closures and detours, visit http://www.ottawacorc.com/road-closures. To see upcoming OCRC road construction projects for the 2019 season, visit http://www.ottawacorc.com/construction-projects.